Nearly Sighted/unearthing the dark will explore the stories of disabled Black bodies throughout history and how their legacies extend far beyond time, colorlines, ability, and sexuality to bridge and impact intersectional discourses on said topics today. This movement exploration is a multi-sensory experience for the audience that delves deep into questions of what it means to see and be seen—as well as from whose lens we are doing the viewing. How does hearing and the idea of listening contrast with what is actually being heard; how is taste felt, while exploring the legacies we leave behind. P.E. is a social rite that profiles the prowess of youth, the abundance of strength. When this social rite is executed by a disabled body it performs prowess differently, yet as jubilantly. Referencing the typical exercises and pillars of it, Phys. Ed. will explore physical education through a revisionist lens and interpret unearthed movements from a hip disabled body. Compounding on notions of youth and grace, Phys. Ed. exercises both restraint and abandon, easily exhausting the performer until he decides otherwise. Phys. Ed. examines the sublime in the mundane. 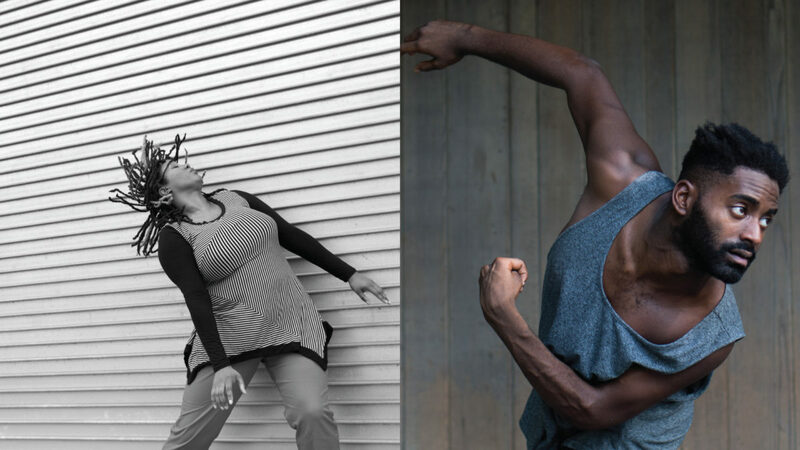 Come early for Living Gallery: Pamela Sneed on Dec. 1st at 7:00 pm for a free performance by New York-based poet, writer, and performer, Pamela Sneed at the Gibney Gallery. Kayla Hamilton is an artist and educator based in Bronx, NY. She is a member of the 2017 Bessie-award cast of Skeleton Architecture curated by Eva Yaa Asantewaa and dances with Sydnie L. Mosley Dances and Gesel Mason Performance Projects. Under the name K. Hamilton Projects, she self-produces collaborative performance works that focus on the intersection of race and disability and; organizes community events; and write arts integrated curriculum that focuses on bridging real-life skills and art. Kayla has been awarded the Dancing While Black Fellowship, Brooklyn Arts Exchange Space Grant and Bronx Council on the Arts BRIO Grant. Photo of Jerron Herman by Daniel Kim; Photo of Kayla Hamilton by Travis Magee. NOTE: Artists and audience members for DoublePlus curated by Alice Sheppard have already made advanced arrangements for access via the 280 Broadway entrance for the Saturday performance. We look forward to seeing everyone.